DUBAI (Sputnik) - Al Arabiya, an UAE-based Saudi-owned pan-Arab television broadcaster, has currently neither an office in Syria nor correspondents in the Idlib province, a high-ranking representative of the broadcaster told Sputnik on Tuesday. "Our broadcaster has nobody in Idlib and we do not have an office in Syria. We do not know anything about other television channels," the representative said. A spokesperson for the CNN Turk channel's international news office told Sputnik earlier on Tuesday that its reporters working in Syria's Idlib are unaware of any filming of a staged chemical weapons attack going on in the province. 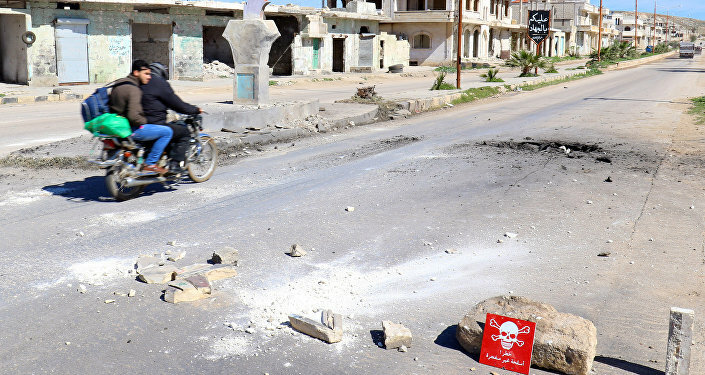 Earlier the day, the Russian Center for Syrian Reconciliation said the filming of a staged provocation with the alleged use of chemical weapons had begun in the Idlib province. A Syrian human rights activist later told Sputnik that dozens of White Helmets arrived from Turkey to Idlib in order to conduct the false flag operation. He said they had tanks containing an unknown gas with them. The Russian military said that the gas was a chlorine-based toxic substance. The center noted that camera crews of several Middle Eastern broadcasters, as well as of a regional branch of a leading US news channel had arrived in Jisr al-Shughur in the morning.